This is clearly the year of the woman on reality television singing show competitions. American Idol produced its first female winner since 2007 and had an all-female Top 5, and now, of the top eight remaining contestants on The Voice, seven of them are women. As I was catching up on this week’s episodes of The Voice last night, I had the thought — how would these women fare against the American Idol ladies? Before I start assessing how the remaining The Voice contestants might have finished on Fox’s (fading) reality hit, it must be said that it’s impossible to do an apples-to-apples comparison of the twelve competitors’ performances thus far, as the parameters of The Voice competition, with blind auditions, battle rounds, and teams, are very different from the context of the Idol stage. 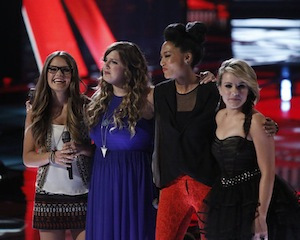 The Voice contestants have frequently been assigned their song, but have also not had to contend with the challenge of theme weeks as Idol contenders do. We also have more data for the Idol ladies –we’ve seen them give roughly twice as many performances as The Voice women, meaning we know more about the Idol ladies’ strengths and weaknesses. Additionally, The Voice singers have had the benefit of working closely with their coaches; who the hell knows who the Idol women work with? Despite all of these differences between the shows, I still thought it would be fun to imagine them all in one big fantasy Idol competition together. So, the big question is — would Candice still have come out on top if she’d had to compete against the likes of Judith, Danielle and Sasha? Here’s how I think things would have gone down if the Top 12 of American Idol was made up of the Candice Glover, Kree Harrison, Angie Miller, Amber Holcomb and Janelle Arthur from Idol, and Judith Hill, Amber Carrington, Sarah Simmons, Sasha Allen, Michelle Chamuel, Holly Tucker and Danielle Bradbury from The Voice. With stronger country girls in the mix, I don’t think Holly’s pipes or Janelle’s personality would have been able to allow them to stand out, and these two admittedly great singers would be the first two to go. Simmons can do amazing things with her voice, but to me she’s a little bit inconsistent, a trait which does not serve you well on American Idol. One poor performance, especially in a field this deep, could send you packing. Both of these women have amazing instruments but have shown difficulty digging into contemporary songs. (Though I must say Allen’s performance of “Not Ready to Make Nice” is my favorite performance of either show so far.) Allen has the more mature instincts, so I think she’d finish a spot above Holcomb. Chamuel’s uniqueness helps set her apart on The Voice (I’m obsessed with her performance of “True Colors”), and I think it would help get her to the halfway point in the competition on Idol, but at a certain point I think the stronger, more commerical singers would pull ahead. Both of these girls are amazing singers and I think both have a real shot at a career, but Angie’s tone is a bit more unique, so I’m giving her the slight edge with the fifth place finish. While Kree’s down-home appeal, compelling backstory and killer vocals took her to the finale on Idol, I think if she had to contend with The Voice ladies she might have had to settle for fourth place. Both of these women are supremely talented vocalists, and while Hill gets the artistry points, Glover has more firepower. I’d give Glover the runner-up slot in a photo finish. With a voice like Carrie Underwood and the marketability of Taylor Swift, not only do I think Bradbery will win The Voice, I think she would have had Idol in the bag as well. Wow, that was tough. These are 12 very talented ladies! What do you think of the order I’ve suggested? How would yours be different? This entry was posted in Television and tagged American Idol, Angie Miller, Candice Glover, Danielle Bradbery, Judith Hill, Kree Harrison, Sasha Allen, The Voice. Bookmark the permalink.